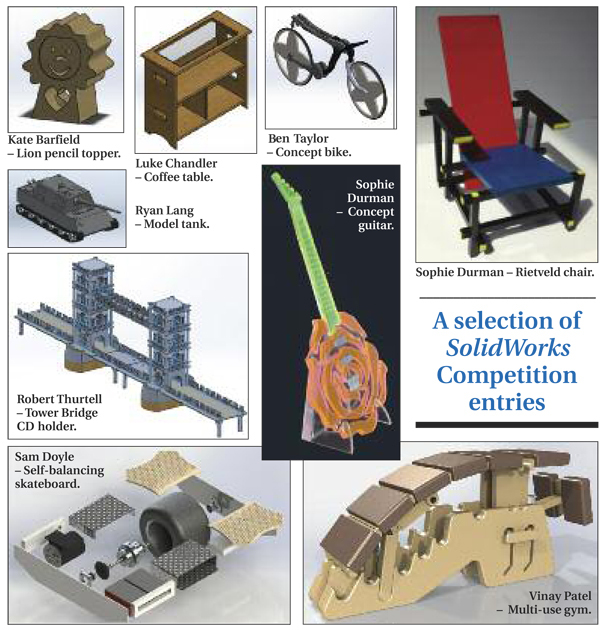 BY THE TIME you read this, our SolidWorks 2014 Competition winners will know who they are and will have received their prizes. Andrew Gregory is senior manager for SolidWorks Education, Europe, and led the judging for us – we were expecting good things and were not disappointed: the standard of entries blew us all away. At the time of writing we are still finalising details so, for the time being, here is a brief run-down of some of the runners and riders and their entries that impressed us so much. The work submitted from AS and A level students was every bit as impressive as the best we see at degree shows but our judging criteria were not just about technical mastery and fluency with the software. We wanted to see how students at all ages and stages were using SolidWorks to visualise, test and develop their ideas for the real design challenges they were working on. Most entrants then used the files they had created for output to CNC machinery. Daisy Burley, Jack Clayson and Katelyn Barfield are all 13-year old students from West Park School in Spondon, Derbyshire. Their designs for 3D printed pencil-toppers showed how simple use of basic modelling tools is all you need to get started. Their models were fun, functional and (clearly) a design challenge they had relished. Jamie Dechiara and Ryan Lang from Oulderhill Community School, Rochdale, took things further with some great work to model parts and then assemble them to test the form and construction of their vehicle designs. Students at Sevenoaks School are clearly making good use of SolidWorks for modelling GCSE projects. Highly effective use of render and exploded views allowed Hugo Sunnucks, Max Paillard and Sam Yeates to perfect and promote their distinct and stylish proposals for furniture. Luke Chandler from Queen Mary’s Grammar School, Walsall, shows how SolidWorks has allowed him to explore new ideas and fresh thinking for the humble coffee table – something of a cliché when it comes to GCSE project work but Luke pulls it off beautifully. Once students get started with SolidWorks (and they have a great idea in their head) things can get out of hand. This could almost be the case with Robert Thurtell’s GCSE project to model a CD stand in the form of Tower Bridge. Robert from Langley School, Norwich, modelled hundreds of parts (we lost count) and then assembled them into a realistic replica of this London landmark. Robert, we salute you! Sophie Durman from Bromley High School makes clever use of SolidWorks to perfect both visual effect and geometry for both her A/S level mini projects. Her guitar project also takes advantage of	the link with 2D Design that enabled her to cut parts on their LaserCAM. SolidWorks is (after all) just a tool and nothing can substitute for technical ingenuity and a creative mind. Put these together and it’s easy to see how SolidWorks is equipping a new generation of designers who are set to shape our world. Nothing epitomises this more than entries from Vinay Patel and Gaurav Bhalla from Queen Mary’s Grammar School, Walsall, and from Ben Taylor and Sam Doyle from Langley School, Norwich.